For your pain, here’s a nice gift: The “DEADMAN” art. 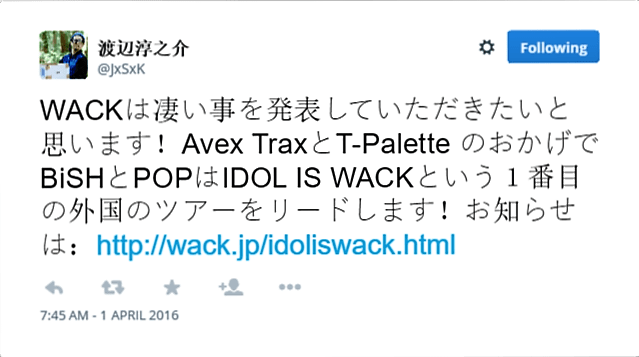 I’ll keep this here as an archive, but please do not believe that WACK is taking the entire BiSiverse (and friends … and enemies) on a world tour. At least not this year. This is not a drill. There is going to be a BiSH-led world tour beginning in June. They’re bringing the whole family with them. This is insane. I am aggravated. First this show was definitely happening, and then “it didn’t,” and then the “IDLE IS DEAD” tour was announced and that’s cool, but: Look, that BiS reunion concert definitely happened (in December), and it looks like it was really great, and I’m going to try to hunt down some video to see just how great, but man alive, the perils of trying to follow things in another country through the fog of Google Translate and limited media in your own language.